Props were acquired in Virginia and New York and transported to the Red Sea in Egypt. The agency creative director acquired the wedding dresses from a property manager from the movie My Best Friend's Wedding. All other prop clothing came from thrift stores since it would be ruined working in salt water. The crew were based on a 120' motor vessel, Moon Dancer and worked from a 20' inflatable boat used to scout for a suitable site and do the shot. 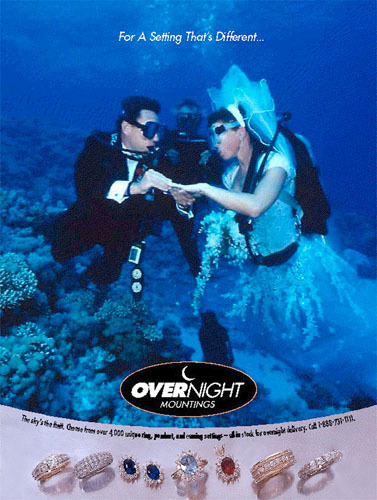 The "preacher" and "groom" had no difficulty, but the water drag on both the wedding dress and veil were substantial so the bride needed to be assisted from the inflatable to the shooting position in about 50' of water near Abu Kefan Reef. While the shoot was in progress, a group of eight European divers on a tour around the reef swam single file through the picture. We were dumbfounded that they would swim through our set-up, so just took a short break and waited for them to pass. It would have been tough to get budget approved for security when shooting on a reef tens of miles from shore and a third of the way around the world.